In the second reported assault by police officers against lawyers in less than two days, a police officer on Monday allegedly smacked a lawyer in an Alexandria court with handcuffs during a verbal dispute over the officer’s conduct towards colleagues, Al-Ahram Arabic news website reported. Tens of lawyers gathered at the Alexandria court of Moharam Beik where the assault took place to demand accountability from the ministry of interior towards its officers conduct, threatening to escalate their protests by organising a sit-in. Ahmad Mahmoud, the lawyer who was reportedly assaulted by the officer, told Al-Ahram Arabic news website that he filed a legal complaint against the officer, saying that he will seek justice through the law. The local branch of the lawyers syndicate in Alexandria, which is headed by Abdel-Halim Allam, said it would follow-up on the investigation, Ahram reported. “Egyptian President Abdel-Fattah El-Sisi himself has called on state officials on a number of occasions to respectfully treat all citizens,” lamented undersecretary of the Egyptian lawyers’ syndicate Yehia El-Touni to Ahram Online in a phone call on Monday. Early in June El-Sisi, apologised to Egyptian lawyers after a much publicised incident in which an attorney was physically assaulted by a police officer at a station in the north Delta, an incident that sparked angry protests by lawyers. 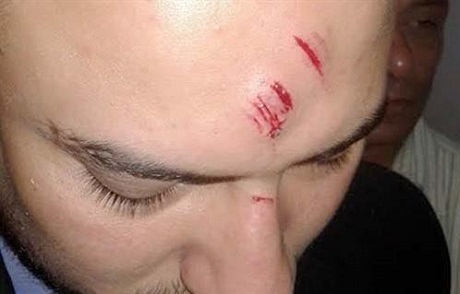 The incident the Egyptian president apologised for involved an assault by a senior officer against a 25-year veteran attorney at a police station in the city of Faraskour in Damietta. “The police insist returning back to the old days, and treating people in the way they used to before the 25 January revolution,” El-Touni told Ahram Online, commenting on recent assaults by police officers on lawyers. On Saturday, a police officer reportedly shot and injured a lawyer in a Cairo court while he was on the job. The injured lawyer, who has been hospitalised, accused the officer of shooting during a dispute. In response to the reported shooting, the head of the Egyptian lawyers syndicate Sameh Ashour suspended work in two Cairo courts on Sunday to protest police misconduct. Lawyers have been protesting against police assaults since the rule of former autocrat Hosni Mubarak. Red Sea occupancy rate 90-100% Egypt, why the media is ruining tourism, and why it’s actually safe to go there.